Biomarkers are molecular substances in the body that can be used to indicate health or disease. These biomarkers can be found in tissue, blood, urine and other body fluids. Biomarkers can lead to individualized diagnosis and treatment. The Biomarker Discovery Program is one of the signature programs here at the Center for Individualized Medicine. It is being used in diagnosis and treatment for a wide range of diseases, such as prostate and ovarian cancer, peripheral T-cell lymphoma, liver fibrosis, and mental health. Biomarkers captures genetic information from cells and analyzes it, searching for genetic patterns to help physicians make more precise diagnoses and prescribe more effective, individualized treatments. 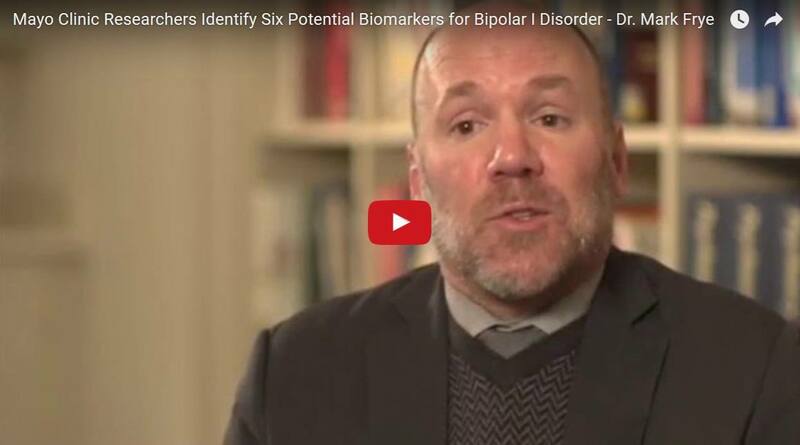 Recently, researchers from Mayo Clinic have uncovered a half-dozen proteins that might serve as biomarkers to identify bipolar I disorder. The Mayo Clinic investigators colleagues examined 272 proteins in a cohort of nearly 300 people with bipolar I depression, bipolar II depression, unipolar depression, and healthy controls. They found six proteins that differed between people with bipolar I depression and controls, suggesting that these proteins might be markers for the condition. The findings appear in the journal Translational Psychiatry. Though the researchers stressed that their findings need to be replicated in a larger sample, they suggested that these proteins might be biomarkers for bipolar I disorder and could help clinicians to better diagnose and treat patients. Up to now psychiatrists have relied on observed symptoms and patient assessments based on interviews. That information is then compared to established diagnostic criteria. In contrast to other medical conditions — such as heart attack or cancer — there is no biological marker in mood disorders in general, bipolar disorder in particular, to help confirm clinical diagnosis. It is critical to differentiate bipolar disorder from other mood disorders as the treatments differ and a medication suited to one condition may be dangerous to patients with another. This feasibility study examined 272 different proteins in 288 separate patient blood samples. Of the study volunteers, 46 had been diagnosed with bipolar I (history of mania) depression, 49 with bipolar II (history of hypomania) depression, and 52 with unipolar depression. They were compared with 141 individuals without mood disorders, known as controls. In total, after adjusting for variables, 73 proteins were found to differ among the four groups studied. The results, however, showed a significant difference for six proteins in individuals with bipolar I depression versus the controls. The researchers believe this to be “one of the first studies to assess the feasibility of high throughput multiplexed immunoassay technology (272 proteins) trying to distinguish different types of mood disorders.” They emphasize the research needs to be replicated using a larger sample and follow up should determine how representative the six proteins are of those that might be unique in association with bipolar I.
Dr. Mark Frye, head of psychiatry and psychology at Mayo Clinic, discusses how Mayo Clinic researchers have discovered a series of proteins that could be diagnostic markers to identify bipolar I disorder. The research was funded by Myriad RBM, Inc., whose technology was used in the study. Myriad RBM has been interested in developing its protein biomarker platform for use in psychiatric disorders. Dr. Frye has received previous grant support from Assurex Health, Myriad, Pfizer, National Institute of Mental Health, and National Institute of Alcohol Abuse and Alcoholism. Representing Mayo, he has been a consultant to Janssen Global Services, LLC, Mitsubishi Tanabe Pharma Corporation, Myriad, Sunovion, and Teva Pharmaceuticals; and has received Continuing Medical Education/Travel Support/presentation from CME Outfitters Inc. and Sunovian. Co-authors include Malik M. Nassan M.B.B.S., Gregory D. Jenkins, Simon Kung M.D., Marin Veldic M.D., Brian A. Palmer M.D., Scott E. Feeder, Susannah J. Tye, Ph.D., Doo-Sup Choi Ph.D., and Joanna M. Biernacka, Ph.D., all of Mayo Clinic.